Conference track contains quite real-case ontologies suitable for ontology mappings task because of their heterogenous character of origin. There are no reference alignments, therefore there are employed methods of a posteriori evaluation There are two possible tasks related to this track, please see section Modalities. Name is derived from name of conference or conference organisation tool. For downloading this ontology, just click on its name. DL expressivity was obtained from SWOOP tool which is Hypermedia-based OWL Ontology Browser and Editor. NEWS (June 4th): One ontology related to conference organisation has been added into collection, see MyReview.owl. 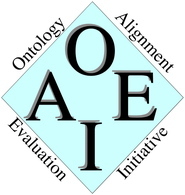 NEWS (July 3rd): You can load whole collection of ontologies into OwlSight browser. This year, there are two tasks related to this conference track. Participants can take part in either of them or in both of them. We ask participants to let us know to which task their results are related when they send us their results according to the schedule (see below). application-specific correspondences - in this case, participants should find out correspondences with regard to application scenario - transformation application. It means that final correspondences are to be used for conference data transformation from one software tool for organizing conference to another one. We will evaluate results of participants with several evaluation methods. final results ready and OM-2008 workshop. We deeply acknowledge the effort of contributors to the collection: Július Štuller (and his team), Dušan Rak, Petr Tomášek, Luděk Mácha, Lenka Navrátilová, Pavel Kříž, David Měrka, Roman Svoboda, Miroslav Joha, Tomáš Zelinka, Jozef Murín and Markéta Horáková. Contact addresses are Ondřej Šváb-Zamazal (ondrej.zamazal at vse dot cz) and Vojtěch Svátek (svatek at vse dot cz). Initial location of this page: http://nb.vse.cz/~svabo/oaei2008/.